Dayspring parents and now Dayspring grandparents, Bruce and Nancy Prestidge, share the story of how they took the true Pilgrim story, learned at Dayspring Christian Academy, across the sea to Russia. In 1989, God began to impress on my husband Bruce’s heart, and mine, to pray for Russia. We never expected to go to Russia. However, in 1991, Bruce was asked to be a part of the first Convocation put on by “The Commission,” the largest known gathering of American Christian organizations. At the invitation of Mikhail Gorbachev, who had just ended communism in Russia, The Commission was tasked with teaching Russian school teachers how to teach Christian morality and ethics in their classrooms. While there, we met Olga, an outspoken Christian school teacher. As we talked, Olga told me that she had been planning on sharing with her students the “myth” about the Pilgrims coming to America, and the first Thanksgiving. I was horrified. I stopped her in mid-sentence and said nicely, “The story of the Pilgrims and the first Thanksgiving celebration is not a myth.” Surprised, she asked me to tell her the story. 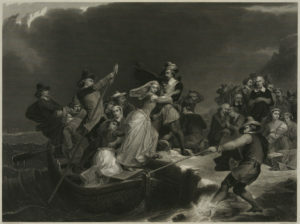 Landing of the Pilgrims on Plymouth Rock, 1620 / P.F. Rothermel paintr. ; J. Andrews engravr. Public Domain. I thanked God that I had taught at Dayspring Christian Academy, and had been taught the true Pilgrim story from the other Dayspring teachers. The teachers at Dayspring glean the facts of the true Pilgrim story by researching the Pilgrims’ journals and writings, as well as other original documents from the time period. 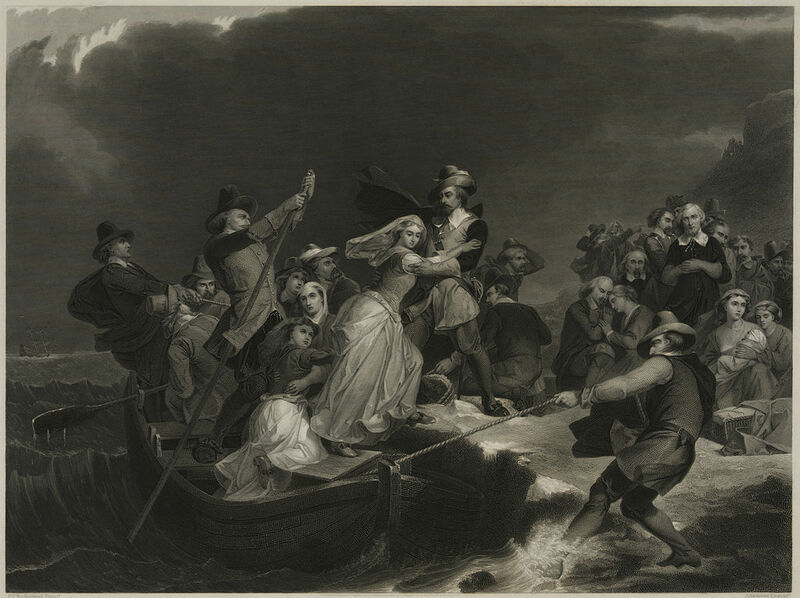 They learned why the Pilgrims fled England (religious persecution under King James), and went to The Netherlands. I explained to Olga that in the Netherlands, the Pilgrims realized the permissive culture was impacting them and their children, so they returned to England, where they bought passage on a ship bound for America. The Pilgrims were to meet up with the Mayflower and another boat, called the Speedwell. However, they soon had to return to shore because the Speedwell was taking on water. Later, the Pilgrims crowded onto the Mayflower and set sail again. I told Olga that the reason we know so many of the details concerning the Pilgrims and their adventures was because a leader of the Pilgrims, William Bradford, and others such as Edward Winslow, kept detailed journals, which were preserved by the providential hand of God. William Bradford’s journal called Of Plymouth Plantation, documents his and others’ thoughts and first-hand experiences. Through these journals, we get a glimpse into how they related to God, how God shaped their ideas concerning governing, their daily life experiences, how they dealt with hardships, and how they related to the Native Americans. Olga was excited, and asked if I would come to her school and tell her students the story of the Pilgrims. Of course, I agreed to do so. When Svetlana, with whom we were staying and who is a famous teacher and representative of Russia at meetings for teachers around the world, heard about this, she asked if I would come to tell the story of the Pilgrims and the first Thanksgiving celebration at her school, too. 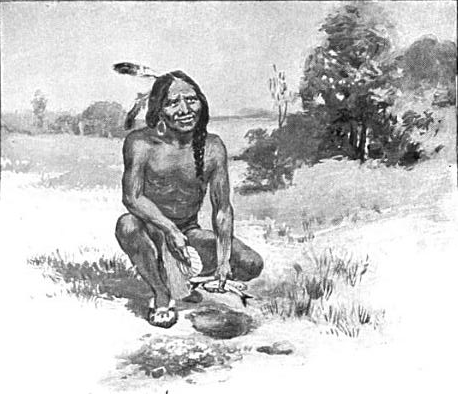 Squanto teaching the Plymouth colonists to plant corn with fish. Bricker, Garland Armor. The Teaching of Agriculture in the High School. New York: Macmillan, 1911. Page 112. Public Domain. At that time, I had more freedom to relate this important and historical story than I would have in American secular schools, because I was able to include how God influenced the founding of our nation on Christian principles. I was able to tell them about how the Pilgrims drew up the Mayflower Compact, describing their plan for governance, where the people were considered equal and ruled themselves, a precursor to the drawing up of our Constitution. I explained that by trial, error, and prayer, they figured out that individuals owning their own land and letting them grow their own crops was the most successful way of farming. I was able to explain to Olga’s wide-eyed middle and high school students that according to the sovereign plan of the Lord of all things, a Native American named Squanto had earlier been captured by the British and taken to England as a slave. There, he had learned to speak English and became a Christian. By the grace of God, he had been freed and he returned to America, only to find his entire tribe had died. He then went to live with the Wampanoag tribe. Squanto was familiar with the English and their ways. So, in 1620, when the Pilgrims landed near his home, Squanto felt God had allowed his past circumstances to help the Pilgrims. Against the advice of his tribe, he went to live with the Pilgrims and showed them what crops to grow and even how placing a fish in the hole with a seed of corn fertilized the soil and helped the corn grow. God used Squanto to interpret, to save Pilgrim lives, and to be a part of bringing peace between the Wampanoag tribe and the Pilgrims. Governor John Carver and Chief Massasoit of the Wampanoag tribe negotiated a treaty in which they agreed to do each other no harm, not steal from each other, to fight for each other if needed, and to live in peace with each other. They agreed to leave their weapons behind when visiting one another. This peace treaty lasted for more than 50 years, longer than John Carver and Chief Massasoit lived. 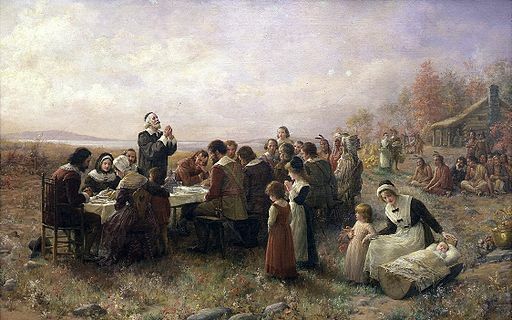 The First Thanksgiving at Plymouth” (1914) By Jennie A. Brownscombe. Public Domain. The first Thanksgiving happened in early autumn of 1621. Only 53 Pilgrims, about half their number, survived their first harsh winter in America. They decided to celebrate and give thanks to God for their successful harvest and their survival. Chief Massasoit and 90 Native Americans came to celebrate for three days. The food they shared consisted of fowl, deer, fish, wild turkeys, corn, and dried fruit and nuts. They enjoyed games and contests, but they also thanked God for being their Protector and Provider. My story concluded with President Lincoln setting aside a day each year for Americans to give thanks to our Heavenly Father for our blessings. Many of our religious freedoms and democratic ideals came into effect through the Pilgrims and their willingness to face difficult situations to have religious freedoms. Like the Pilgrims, we, too, need to take time out of our busy lives to meditate on all the ways God has been our Protector and Provider, and worship Him with hearts full of thanksgiving- on Thanksgiving Day and every day! 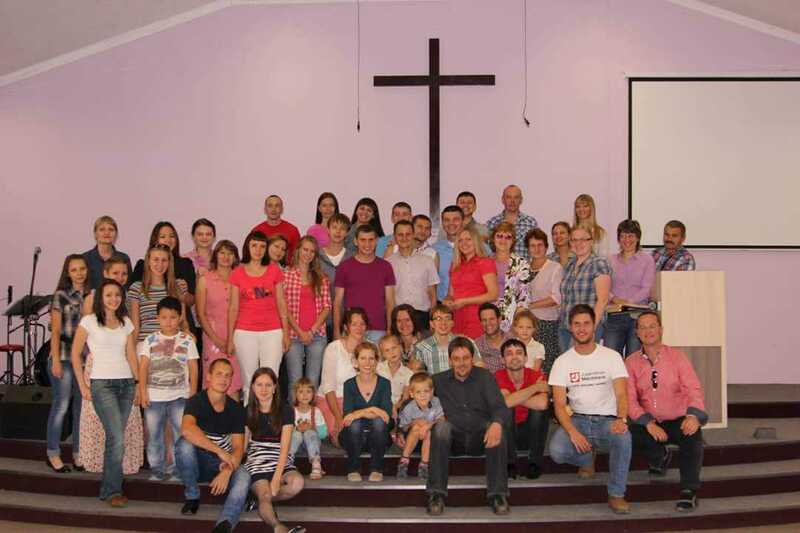 Bruce and Nancy’s church family in Blagoveschensk. God led Bruce and me to begin praying for Russia. He then opened the door for us to be part of the answer to our own prayers. Through our involvement with The Commission, Russian teachers came to Christ, who in turn led their students and their students’ parents to Christ at a time when there was an openness in Russia. Fourteen years later, He gave us the opportunity to go to Blagoveshensk, the most communistic part of Russia, and fan the flame for Christ. God used the true story of the first Thanksgiving, which vividly speaks of our providential and loving Heavenly Father. What a blessing it is to hear how God used the work of Dayspring Christian Academy working through Bruce and Nancy Prestidge to reach people with the gospel in communist Russia!